There is something that even after living in Switzerland for five years I cannot understand: Why Swiss companies can't design a decent website. I realize that like most things in Switzerland, 20 years behind the times is about standard. And nothing proves this point more than these websites. Yes. Instead of designing for the Internet, these companies seem to think it works to design for direct mail and use the direct mail ad as the website. 1. Direct mail is bad enough in paper format. 2. Direct mail on the web is even worse. Most of these websites also seem to forget that online commerce is something that is possible in the 21st century. Heaven forbid I would want to see an overview of what a store sells and actually order something with my credit card. Anyhow, here is a good representation of the quality of a .ch. Have fun. Are you often frustrated by Swiss websites? Know of any other bad ones I'd enjoy? I completely agree with the list above! You can add Conforama.ch as another guilty of plastering their direct mail online as a "website". Sometimes it seems like a trick to get you to go into their store to find out whether they have the product you're looking for. 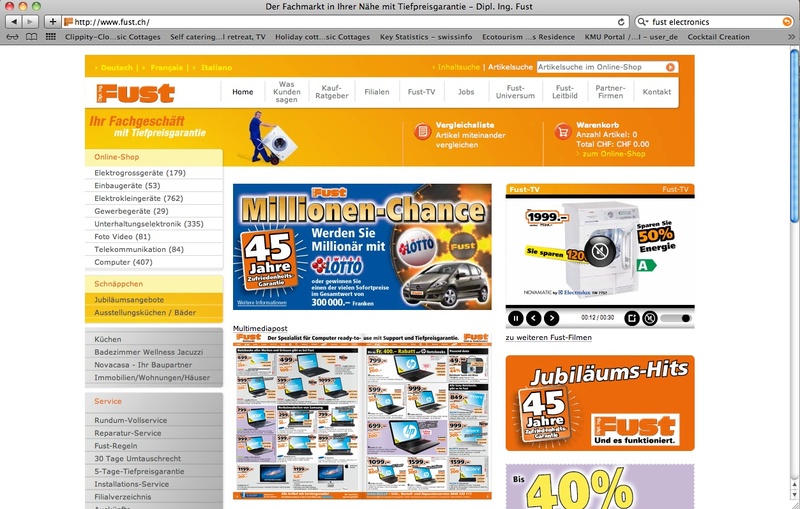 There is some hope for Swiss ecommerce from leshop.ch and coop@home but even these sites have their quirks. Coop@home has the 'feature' that items in your shopping cart timeout after 90mins, so if you take a break while shopping you can return to find a smaller cart and have to guess what's been removed. comforama.ch is a great one, thanks. Haven't tried leshop.ch yet. But it's good that there is some hope! My biggest frustration is that they are designed as if everyone was german speaking. Hello? How many official languages are there?? Agree about the language thing too. And just this morning we were going to order some furniture from ikea.ch, only to learn that only one out of the five items is available to be purchased online. What is that?